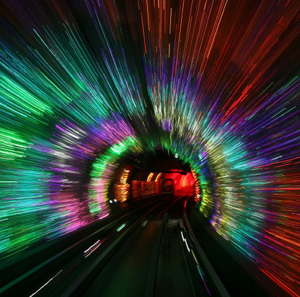 Time travel and teleportation have long been popular modes of transportation in science fiction. H.G. Wells’ book, The Time Machine, was published in 1898 and launched a science-fiction time-travel genre that has spawned dozens of wildly successful and diverse entertainments, from action-horror films like The Terminator series, to lighthearted teen comedies like Back to the Future and Hot Tub Time Machine. In 1966, Star Trek made its television debut and the teleportation directive, “Beam me up, Scotty,” entered the pop-culture lexicon. Like time travel, teleportation was used to tell a variety of different stories. The mutant Nightcrawler, from the X-Men comic books and films, used his powers of teleportation to assist his fellow mutants in a swashbuckling struggle for survival, while director David Cronenberg brilliantly used the technology as a backdrop for his 1986 remake of The Fly.